Oh no, what a mess! Mud is everywhere… but this set of coloring sheets for children is ruled by the family of cute, pink pigs. So it just couldn’t look different. You’ll find here Peppa, her little brother George, Mummy Pig, Daddy Pig and a bunch of hilarious friends known from TV series. And under coloring pages waits for you a short quiz and a section with uncommon facts about pigs’ life. So don’t forget to look there too. Quiz how good do you know Peppa’s world? Place your mouse cursor over a question – you will see the right answer! 2. What’s the name of Peppa’s little brother? 3. What’s favourite toy of Peppa? 4. What’s the name of a sheep – Peppa’s best friend? 5. What animal is Doctor Brown, a local doctor? 6. What does daddy Pig do for a living? 5-minute episodes of Peppa Pig were already shown in 180 countries all around the world and translated into 40 different languages. In Australia, one of the episodes was banned due to its content. Namely, it taught children not to be afraid of spiders. Unfortunately, in Australia live lots of poisonous species which can be very dangerous so it could have had very bad consequences. Peppa Pig character was created by 3 friends who met in college in the ‘80s. The idea turned out to be a hit and all three are extremely rich people now. The very first episode “Muddy Puddles” was aired on British TV Channel 5 in May 2004. What was the episode’s content? Peppa was sad because due to the rain she couldn’t go play outside. But later, when the rain stopped, she goes outside with her little brother George, to jump in muddy puddles. One of the creators, Phil Davies, stated that lots of Peppa’s adventures were based on the real situation which occurred in his own family. A resident of Italy Capra Gabriella complained that cartoon ruined her life. Her problems started when the goat Gabriella joined the group of characters. Unluckily Capra Gabriella in Italian means exactly… goat Gabriella. She heard too many hints against her and she became tired of that. Printable pictures of the cutest pigs family! 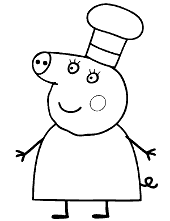 This selection of completely free Peppa Pig coloring pages is a great choice for little children. The most favorite pig of all kids is waiting for your crayons with her entire pink family: little brother George, beloved Mummy Pig, wise Daddy Pig, grandpa and grandma. You’ll find here also her animal friends on a set of adventurous pictures: Mr. Elephant, Miss Rabbit, Edmond Elephant, Suzy Sheep, and others. So just pick, print and color your favorite worksheets now. And after that try to guess all correct answers in a short quiz. If it’s too easy then please let us know. We can add some extra content for the most active children. Peppa Pig coloring pages contain 40 great quality pictures, which will provide entertainment for long hours. Try to finish them all!